Q What do you hope your new book The Way of the Wind: The Path and Practice of Evolutionary Christian Mysticism will achieve? A To inspire and re-source people on their evolving soul paths. All of history is being drawn toward a future that will reflect the heart and soul of the Christ mystery. What I discovered, and what I write about in the book, is that evolution just happens naturally if we get out of the way. Q What is your definition of evolutionary spirituality? A It’s a recognition that reality as we know it is being animated by an evolutionary current. This is true on the cosmological large-scale structure of the universe. It’s true biologically. But it’s true on a human level, too. The great mystery is living and wanting to transcend itself through us toward greater expressions of beauty, truth and goodness. And so evolutionary spirituality says that, for lack of a better word, God is implicate, intrinsic to that evolutionary push. What I do is bring that perspective to interpret and unlock some of the deeper lineages of the Christian mystery. I bring that perspective to try to interpret scripture, for example, Jesus’ teachings. While life-long scientist Rupert Sheldrake believes strongly in the scientific approach, he has “become increasingly convinced that the sciences have lost much of their vigor, vitality and curiosity. Dogmatic ideology, fear-based conformity and institutional inertia are inhibiting scientific creativity.” So begins his groundbreaking book Science Set Free which is a sustained rant against the reductionist materialist philosophy that has been foundational to the scientific world since the nineteenth century. (By the way, the materialism he is talking about is not the capitalistic consumerism that grips the ever-spreading global market, but the philosophy of materialism that insists on a mechanical view of nature). Sheldrake maintains that it is well passed time for a change, a breaking open of the closed system that arrogantly supposes that truth can be contained within its own dogmatic boundaries. Sheldrake names ten dogmas which form the creed of modern science: everything is a machine; all matter is unconscious; the amount of matter and energy stay the same; the laws of nature are fixed; nature is purposeless; biological inheritance is material (genetic); minds are confined to brains; psychic phenomena are illusory; mechanistic medicine is the only kind that works. 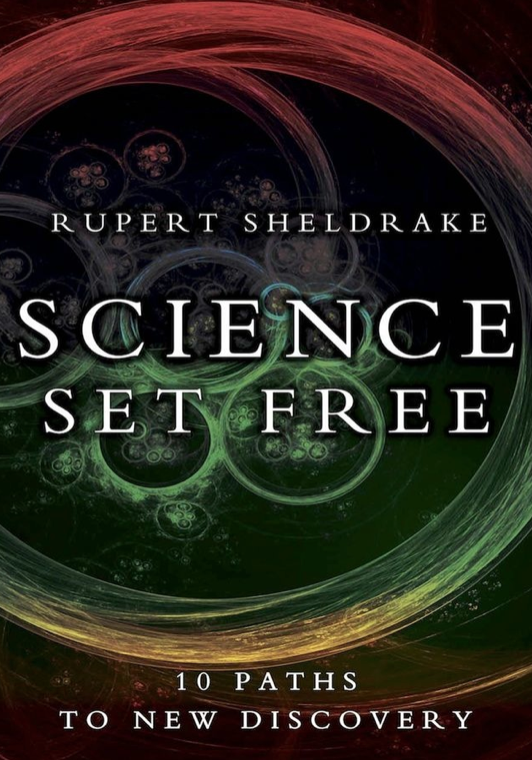 In the main body of ‘Science Set Free’ Sheldrake scrutinizes the dogmas of science with their materialist foundation and challenges them by proposing a new paradigm that breaks open the fundamentalism inherent to the scientific worldview. It is centred on his work with morphic resonance and morphic fields. Rather than holding the standard scientific position that the laws of the universe are fixed, Sheldrake is concerned with a truly evolutionary cosmology where laws do not remain the same but are more like habits of the universe that are evolving. Morphic resonance is a continually creative process whereby self-organising systems (not machine-like entities – the entire universe is more like a growing, developing organism than a machine) pass on their patterns and forms to future systems which then gradually evolve and form new habitual patterns. If something is repeated it forms a habit and distance/time do not affect its spread. When habits form, they are initially difficult to adopt, but as they take hold, they spread with ease and exponentially increase their field of operation. Sheldrake proposes an inherent collective memory in nature which allows change to take hold. In Chapter 8 of Science Set Free, Sheldrake explores the question of whether minds are confined to brains. Neuroscience insists that material brains contain the mind and store memories in “material traces” within the brain (although no-one can prove this). Without the brain there is no consciousness and when the brain dies there is nothing that can possibly continue. Sheldrake proposes that brains are like TV receivers that pick up on fields of morphic resonance extending into time and space. It is more true to say that the brain is in the mind than the other way round. Likewise bodies are not machines controlled by genes, but they take on the patterns and habits from previous generations within the collective memory of a species – genetic inheritance is part of this dynamic organic system. Science Set Free allows the reader an inside view of the internal philosophic debate of the scientific community. While it is important and enlightening to understand the contours of this heated discussion and how it shapes the broad sweep of western thinking, the average reader may be left wondering why it takes our giant institutions (both scientific and religious) so long to change. Most of us have been quietly assuming all along that minds are not trapped in brains and that life in the universe has some kind of meaning and purpose. Thank goodness some brave souls like Rupert Sheldrake are willing to stick their necks out and suffer the rejection and ridicule of the scientific establishment to promote genuine, open inquiry into the nature of this astounding, mysterious reality we all share. Margaret is author of “The Cosmic Pilgrim” and a member of the Earth Literacies team.